More than 7,500 colleges, universities and agencies in more than 130 countries rely on TOEFL test scores to help make admissions decisions. You can take the TOEFL test at your choice of more than 4,500 conveniently located test sites in more than 165 countries worldwide. You also save time and money since the entire test is given in one day, rather than coming back a second day like some other tests. 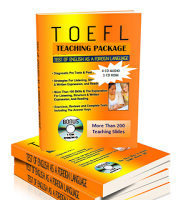 TOEFL test scores help you stand out because of the TOEFL test's reputation for quality, fairness and 100% academic composition. It is the most widely accepted English-language test in the world, including more than 7,500 colleges, universities, agencies and other institutions in 130 countries. And that list includes the top 100 universities in the world.